From way back when, visiting artists such as surrealist painter Sylvia Fein in the 1940s offered students in Ajijic art materials and encouragement. In 1954, authoress Neill James, almost a decade after she had moved to Ajijic to recuperate from a serious climbing accident, started a tutoring program for local youngsters. Children who worked hard were given art materials to paint and draw. This was the beginning of Ajijic’s famous Children’s Art Program (CAP). Early classes combined reading and writing with art. James became so committed to the project that the following year she opened a public library, donating the building to the village. She later opened a second library. She was sufficiently impressed by the efforts and creativity of several young artists that she arranged for them to continue their art education by attending classes in San Miguel de Allende. To its eternal credit, the Children’s Art Program provided (and continues to provide) one of the stronger bridges between the expatriate “colony” and the local community. Almost all families in Ajijic have benefited from the program at one time or another. As the program expanded, greater organizational skills were required and the Lake Chapala Society stepped in to offer its support to help run the libraries and the art classes. Javier Zaragoza and Jesús López Vega. 2012. 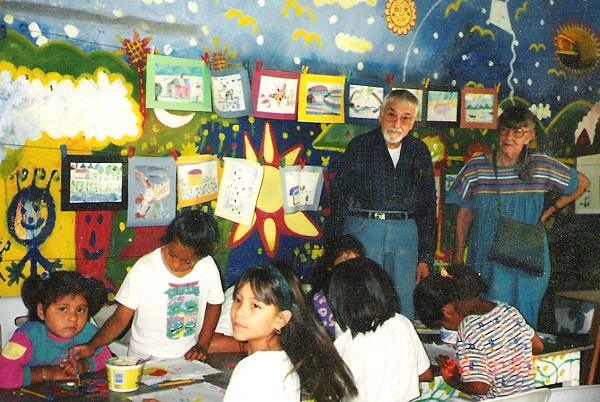 Children’s Art Program mural, Lake Chapala Society. For most of the first three decades of the Children’s Art Program, James was ably assisted by Angelita Aldana Padilla. One of Aldana’s nephews, Florentino Padilla (who lived from about 1943 to 2010) was one of the first students to be given a scholarship by James to study in San Miguel de Allende from 1960 to 1962. On his return to Ajijic, Padilla gave back by teaching the next generation of CAP students. He helped promote the sale of the children’s “bright, charming paintings” to raise funds for materials and supplies. In 1964, for example, Padilla and Paul Carson (the then president of the Lake Chapala Society) arranged an exhibition-sale at the Instituto Cultural Mexicano-NorteAmericano in Guadalajara of over 50 paintings by youngsters who had been taught at the Biblioteca. Nearly all the paintings sold. Padilla’s niece, Lucia Padilla Gutierrez, is also a gifted artist who attended CAP classes, and her own son became the third generation of this particular family to benefit from the program. Many other later CAP alumni, including Javier Zaragoza and Jesús López Vega, have also given back to the program by teaching classes. Every time CAP artwork was sold, a healthy percentage went to the individual student artist, as it still does today. In the 1970s, regular shows of CAP art were held in Ajijic. For example, in 1973, an exhibition of student work was held at the Tejabán Restaurant in Ajijic (then run by Jan Dunlap and Manuel Urzua). The acclaimed American photographer Sylvia Salmi (who had retired to Ajijic a decade earlier) and Peggy Duffield helped promote and organize the show. The following year, Betty Lou and John Rip, who were frequent visitors to Lake Chapala, purchased CAP paintings to decorate all 44 rooms of their Mayan Motor Inn in Laredo, Texas. For a variety of reasons, including Neill James’ advancing age and ill health, the CAP ran out of steam in the late 1970s and there were no regular art classes for children from 1979 to 1984. Classes were revived – initially during summer vacation and shortly thereafter year-round – thanks to the joint efforts of the Lake Chapala Society and the Ajijic Society of the Arts and the tireless endeavors of Mildred Boyd, an American writer and volunteer, who stepped forward at just the right time. Boyd, who died in 2010, dedicated thousands of hours of selfless service to the cause of CAP. When Boyd came across a stash of long-forgotten works done by students who had been in the program decades earlier, she (with the help of one of her daughters, Judy) assembled a heritage exhibition that included early works by several children who had gone on to become successful professional artists. The Legacy Art Collection (paintings and other works, some dating back to the 1950s, by children in the Children’s Art Program), the patrimony of all the people of Ajijic, is now in the care of the Lake Chapala Society. The collection is being catalogued and around 400 individual items can be viewed online via this online database. Boyd’s two daughters are supporting LCS attempts to digitize, catalog and preserve hundreds of the better paintings and hope that regular exhibits in the future will showcase the extraordinary artistic talents of so many local families. The first major retrospective, spanning more than 50 years of paintings from the program, was held at the Centro Cultural Ajijic in October 2014. The 60th Anniversary exhibit featured 130 works by CAP alumni. The “legacy artists” included José Abarca, Antonio Cardenas, Efren Gonzalez, Ricardo Gonzalez, Antonio Lopéz Vega, Jesús Lopéz Vega, Bruno Mariscal, Juan Navarro, Juan Olivarez, Lucia Padilla, Daniel Palma, Lucia Padilla, Javier Ramos, Victor Romero and Javier Zaragoza. Frank Wise and Mildred Boyd with Children’s Art Program students. Credit: Lizz/Judy Boyd. 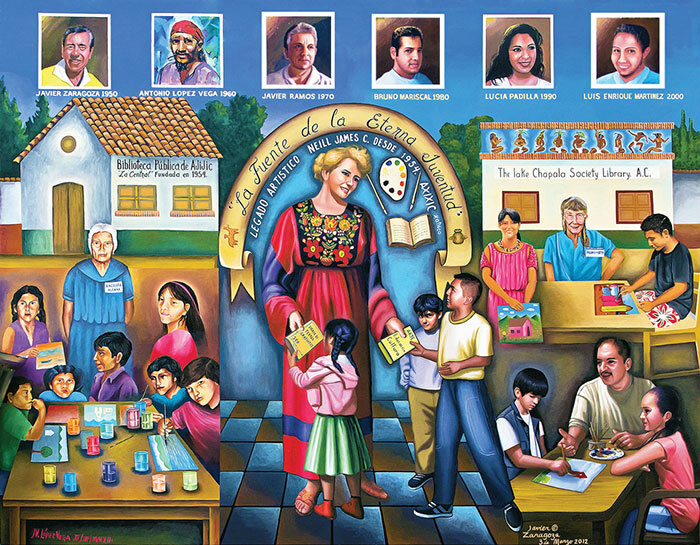 The Children’s Art Program is commemorated in a colorful mural at the Lake Chapala Society entitled “Six Decades of Children’s Art” (“Seis décadas de arte infantil.” The mural, financed by the Ajijic Society of the Arts (ASA) and painted by program alumni Jesús López Vega and Javier Zaragoza, was unveiled in March 2012 and pays special homage to the three remarkable women who ensured the program’s success: Neill James, Angelita Aldana Padilla and Mildred Boyd. Today, between 50 and 70 local children participate each week in art classes given by CAP. Both CAP and the children’s library remain integral parts of the links between the Lake Chapala Society and the local community. Ironically, in spite of her contributions, and the fact that she gifted her own home to the Lake Chapala Society, Neill James was never a member of that organization, preferring to support Mexican causes rather than expatriate ones. Artists of note who began their art careers by taking classes in the Children’s Art Program include José Abarca; Armando Aguilar; Luis Anselmo Avalos Rochín; Antonio Cardenas Perales; José Manuel Castañeda; Efren González; Ricardo Gonzalez; Antonio López Vega; Jesús López Vega; Bruno Mariscal; Luis Enrique Martínez Hernández; Dionicio Morales López; Juan Navarro; Juan Olivarez; Florentino Padilla; Lucia Padilla Gutierrez; Daniel Palma; Javier Ramos; Victor Romero; Javier Zaragoza. The Children’s Art Program can always use additional help. To donate time, funds or resources, contact the organizers. Mildred Boyd. 2001. “Children’s Art Alive and Well in Ajijic!”, El Ojo del Lago, Vol 17, #10 (June 2001). Guadalajara Reporter: 24 Sep 1964, 10; 1 Oct 1964; 10 Nov 1973; 16 March 1974.